Clear skies. Low 43F. Winds SSE at 5 to 10 mph.. The results of a water test are charted July 13 at Magic Valley Labs in Twin Falls. Owner Shelly Kolar says the city is proactive with their testing. 'The city of Twin Falls exceeds the amount they are required to do on a monthly basis with their bacteria testing,' she said. Water makes its way through the Sodium Hypochlorite Generation System July 9 at a Hypochlorite station in Twin Falls. The system shocks water with 34 amps of electricity to cause the water to release a hydrogen ion, changing its composition from salt water to sodium hypochlorite. Senior Water Supply Technician Jeff Malina said the city can chlorinate between 0.20 to 4.0 ppm. Twin Falls chlorinates at 0.35 ppms to clean the water. Senior Water Supply Technician Jeff Malina takes a water sample from a faucet July 9 at the Harrison Booster Station in Twin Falls. Malina said the DEQ and EPA require random water checks based on population size. Throughout the month, Malina and his crew sample 54 different sites within Twin Falls. Malina said if a test fails, it can usually be traced back to the technician who took the sample. 'A little bit of dust or dirt in the jar will fail that sample,' he says. Samples sit in an incubator in the chemistry lab July 13 at Magic Valley Labs in Twin Falls. Owner Shelly Kolar said results for microbiology tests come back within 24 hours, but other tests can take anywhere from three days to three weeks to complete. General Manager Justin Russell sprays down a car before it enters the car wash Tuesday, July 17, 2018, at Rocket Express Carwash in Twin Falls. Owner Joe Russell says the business uses 30 gallons of water per car and reclaims 80 percent of the water that they use. 'Our water use is about 25 percent of the average water use of people washing their cars at home,' Joe Russell says. Water runs through the pump station July 9 at the Harrison Booster Station in Twin Falls. Jeff Malina, senior water supply technician for the city of Twin Falls, said 70 to 80 percent of the city water is pumped from the Blue Lakes wells. 'We can pump 24,000 gallons a minute from that facility,' he said. A water sample is taken July 9 at the Harrison Booster Station in Twin Falls. The city samples 54 different sites throughout the month. The number of required water samples changes based on population size. Marc Abjean, a senior vice president with Chobani, gives a partial tour of the plant's reverse osmosis filtration system in 2014. Michael Gonda, senior vice-president of corporate affairs, says utilizing conservation technology like the reverse osmosis system is crucial for companies looking to be economically and environmentally sound. 'When you look at it, it's a bunch of pipes, but when you see the impact it has it's pretty extraordinary,' Gonda said during a July tour of Chobani. A car exits the car wash July 17 at Rocket Express Carwash in Twin Falls. Rocket Express uses solar energy and a water reclamation system to reduce their carbon footprint. 'It doesn't make economic sense today to do what we're doing with the solar power, but it will over time,' said owner Joe Russell. Lab Technician Sarah Hoy vacuum seals a sample sheet July 13 at Magic Valley Labs in Twin Falls. Owner Shelly Kolar said E. coli and coliform are the main concerns with drinking water. 'For microbiology testing, we probably test about 6,000 samples a year,' she said. A car goes through the car wash July 17 at Rocket Express Carwash in Twin Falls. Owner Joe Russell said his business uses both solar power energy and renewable water. 'We've tried to step things up in the car wash industry,' he said. TWIN FALLS — Despite living in the High Desert, Magic Valley residents are rarely forced to consider their water usage. Conservation is a constant point of emphasis, of course, and for good reason. But the region has sufficient water to go around, at least for the time being. 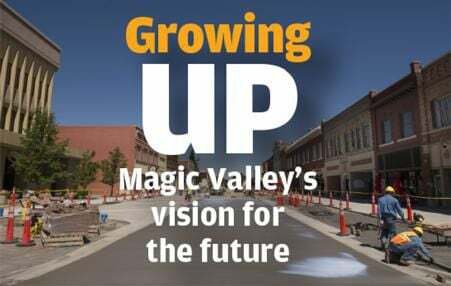 For that, they can thank the Magic Valley’s founders. In a state where water rights are “first in time, first in line,” having a 100-year-old water right can be the difference between thriving and simply surviving. According to the Idaho Department of Water Resources, Twin Falls owns water rights that date back to October 11, 1900. That puts the city 14 years before Pocatello’s first water right and 27 years before Idaho Falls. “Our forefathers here were brilliant when they bought all the water rights,” said Drew Foster, senior water supply technician for the city of Twin Falls. All of the region’s drinking water comes in the form of groundwater pumped from wells. But our access to surface water is what set up Twin Falls for the growth it’s experiencing today. Having the right to use surface water – instead of just groundwater – allows the city to save millions of gallons of potable water each day. The city’s relationship with Twin Falls Canal Company puts it in a steady position to handle growth. Jeff Malina, a senior water supply technician with the city of Twin Falls, said the city owns the largest portion of shares in the canal company. Today, surface water is used in the city’s pressurized irrigation system to water lawns. “We’re probably ahead of the curve on any other city in the state with our pressurized irrigation system,” Malina said. The water used for pressurized irrigation is dirty water that is unfit for consumption. It’s surface water drawn from canals and rivers, and cannot be used in homes. Domestic water, however, is potable groundwater pumped from wells for people to drink, cook and bathe. “We’re saving ourselves probably 8-10 million gallons a day,” said Water Superintendent Robert Bohling. Unlike cities such as Pocatello and Idaho Falls, Twin Falls’ pre-existing infrastructure and relationship with the canal company allow the city to use a resource that others don’t have. “They watch the water run by,” Foster said. Twin Falls uses about 25 million gallons of potable water a day in the summer. Pocatello Water Superintendent Justin Armstrong said his city, whose population is roughly the same size as Twin Falls, uses 32 million gallons a day in the summertime. In the winter, both cities use about 8 million to 10 million gallons a day. Pocatello does not have a pressurized irrigation system, so all of the water used in the city is potable groundwater. The summertime difference can mostly be attributed to Pocatello’s lack of a pressurized irrigation system that supplies surface water. “Some of our peak days actually exceeded 37 million gallons a day, and that was when the population was smaller,” Armstrong said. For Pocatello, Armstrong believes the future lies in conservation. A tiered rate structure provides citizens with incentives to conserve water, as it gets more expensive the more you use, and new water meters are being installed that can track up to a quarter-gallon per minute. Fifty miles up Interstate 15, Idaho Falls faces a different set of challenges. The city, with a population of roughly 62,000, doesn’t have a way of tracking their groundwater consumption. “What would have been great is an installation of meters back when the city was founded,” Water Superintendent David Richards said. According to a Water Facility Plan the city published in 2015, the total cost predictions for installing meters throughout the city will exceed $166 million. Without meters, their water use is significantly higher. In 2013, when the population was 4,000 fewer residents than it is today, Idaho Falls used an average of 43.6 million gallons a day in the summer and 11.4 million gallons in the winter. According to the Water Facility Plan, research estimates a 30 percent reduction in daily use and 40 percent reduction in peak day demand of water when metered. With aquifers across the state on the decline, most cities are looking at conservation as the key for sustainability. But there is reason for optimism: The State Water Board said in mid-July that the Eastern Snake Plane Aquifer enjoyed its largest year-over-year increase in 80 years between spring 2017 and spring 2018. “It’s like a glass,” Bohling said. “If you keep putting straws in it, pretty soon the inflow can’t handle the outflow, and that is a huge concern. There’s no doubt in my mind that (recharge efforts) have to happen or we will dry the aquifers up,” Bohling said. When it comes to conservation, everyone has a part to play. Joe Russell, owner of Rocket Express Car Wash in Twin Falls, installed water reclamation systems in all of his carwash locations. The system reclaims 80 percent of the water used. With each car requiring 30 gallons of water and Rocket Express serving thousands of cars a month, water reclamation systems can make a significant difference. Rocket Express also uses solar energy with their car washes. Russell admits that the solar energy doesn’t make economic sense yet, but it will over time. Larger companies such as Chobani are evaluating their conservation efforts. Michael Gonda, senior vice-president of corporate affairs, said the real focus over the past few years is how they can conserve and preserve what resources they have. “When you take a topic like water, it is emotional because it is so vital,” Gonda said. Within the last five years Chobani has installed a reverse osmosis filtration system in the Twin Falls plant. The system extracts water from whey, a byproduct of yogurt, that can be reused within the facility. “Whether you are in a plentiful or scarce environment, you have a responsibility to do everything within your power to take seriously the role of conservation,” Gonda said. To do that well, Gonda believes companies need to invest in the technology available. As companies find creative ways to conserve, water usage in several cities is on the decline – a positive sign for the state’s long-term outlook. Research from a growth study in Pocatello shows that 10-year water consumption averages have decreased from 5.3 billion gallons a year to 4.8 billion gallons. Statistics for Twin Falls show the same results. “Even though Twin Falls is growing, our potable water usage is trending downward,” Bohling said. Without water meters, it’s difficult to tell if Idaho Falls is reducing their water consumption, but the city is taking the initiative in addressing their problems and finding conservation solutions for the future. “What we’ve done well currently is cleaning up our own act,” Richards said. In addition to metering, Idaho Falls is considering converting green spaces such as parks and cemeteries onto surface irrigation water. They’re also exploring new ways to make their existing water rights more efficient. Even in Twin Falls, more can be done to conserve. Xeriscaping or desert-scaping are becoming more popular methods to reduce water usage on lawns. Bohling also recommends a re-evaluation of our current rate structure to encourage people to use less. “When you look at other cities comparable to us...their water rates are the opposite,” he said. “The more you use, the higher it gets.” Twin Falls currently offers discounts at different stages, making the water cheaper the more you use. With countless court battles and a statewide adjudication process to catalog and confirm current water rights, the vitality of water is clear. The resource is a precious commodity that is becoming scarcer throughout the state, and people are willing to fight for their share. “Water is the new gold,” Bohling said. Which Twin Falls accounts used the most water in 2017? *Chobani Idaho, Inc., and Glanbia Food, Inc., have several accounts through which the companies use water. 4. Buy conservation shower heads, take shorter showers and don't continuously run the water when washing dishes by hand. "It's the little things that count." - Drew Foster, Twin Falls senior water supply technician. 5. Keep your pressurized irrigation filters clean to ensure your sprinkler system works properly. "Groundwater is not an infinite source. We need to save that groundwater for drinking." - Robert Bohling, Twin Falls water superintendent. BOISE — Businesses in Idaho Power’s service area have reported an increase in calls from scammers claiming to be from the company.